One question I get often is, can a CFO be a CEO? After being in the business of working with CFOs for over 25 years, I’ve learned one thing… CFOs and CEOs under historical contexts do not understand each other. Because of that, it’s been my sole mission to transition the role of a CFO into a financial leader and thus a wingman to the CEO. Can a CFO be a CEO? is a great question, but it’s difficult to answer whether or not a CFO can be a CEO without comparing the two roles. Before we get into the differences, we want to explain that while we may draw broad conclusions about these roles, there are always outliers that defy the stereotypical role. Over the past 25 years, I’ve come to a realization about financial leaders turning into executive leaders… A typical financial-minded person will sometimes have a harder time becoming a CEO because of the differences in the way they think. A person in a financial leadership role, such as a CFO, often uses more of the left side of the brain. Biologically, these types of persons are logical thinkers, reasoners, and analysts. This all makes sense when you are sitting in a room full of financial-minded people! The conversations and body language are different. The type of person best suited for a CFO position needs to have the ability to point out the problems and figure out a solution to fix them. While the CFO tends to use left side of the brain, the CEO often relies more on the right side of the brain where the imagination, creativity, and intuition centers lie. While the list above does not fully encompass the characteristics that a CEO needs, it highlights the difference in the role of a CEO from that of a CFO. It requires more people skills, communication skills, and creativity. Probably the most striking difference between CFOs and CEOs is their level of creativity. Problem solving is crucial in either role; to solve problems, creativity is needed. I once took a class at Rice University about “Creativity.” The professor drew a stark comparison between Creativity and creativity by explaining that every person can be creative. Each person though has different views on what creative means. Big-C creativity can be easily spotted. They are the people that when given a problem to solve, they immediately start thinking of off-the-wall ideas to fix it. This form of creativity is needed for those in a position that requires a little bit of risk taking, pioneering, and creativity. A CEO, creative director, or President of a company should have the capability to draw from Big-C creativity pools. Conversely, Little-C creativity can be seen as someone trying to create something within the confines of 4 walls. It’s against the rules to walk outside those 4 walls, build onto them, and think outside the box. This type of creativity can still return some incredible ideas, but it can only go so far. Sound familiar? If you’ve ever sat in a room full of accountants, the ideas thrown on the table are often limited due their view on what being creative means. So often with clients, I find that the CFO often attributes financial woes to a slowdown in the market. When I come into a company to consult, I almost always find that there are greater issues than what’s being looking at. These issues can be found in other departments such as marketing or sales. Inventory could be backed up for some unknown reason. It is the CFO’s job to put on the hat of a Big-C creativity personality type so that they are able to dig to find the greater issue at hand. So how can a CFO become (or at least think like) a CEO? By evolving from a financial person to a financial leader. Look at what you can bring to the table. By having the ability to oversee and impact the financial side of the company, the CFO is better able to understand the financial implications of any decision made. Already, the CFO interacts with multiple departments, such as IT, risk management, HR, compliance, and administrative duties. This variety of work requires matured people skills, a little bit of risk taking, and strong decision making skills. Long gone is the age of just looking at the other person’s shoes and demanding results. The goal here is to demonstrate that you have people skills and that you aren’t just a numbers person. People skills are required to be a good CFO and a CEO. Step out of our your office or cubicle to start getting to know everyone you work with. Learn how someone on the other side of the office building is doing with anything. It’s so important to start talking to all different kinds of people in order to get the bigger picture. Everything that happens in a company winds up in accounting at some point, so get to know the players along the way. CFOs and other financial-minded people are typically averse to risk. They want to know all the consequences of their decision before they make it, but that’s not realistic to expect. You’re good at calculating, so transition into taking calculated risks. How do you do this? Start by going into the field to get experience from which to make decisions. If you know the nuts and bolts of how something works, then you’ll be more informed and more comfortable taking a risk that an idea will boom rather than bust. As you get more comfortable taking calculated risks, your colleagues will see you as as the CFO rather than the CFnO. Decision making is a crucial role in either the CFO or a CEO position. The real difference between the old financial person and the new financial leader is in making decisions that are not based solely on numbers. Try to key into some of the CEO’s Creativity and let yourself out of the box. Great decisions are useless without communication. Recognize the importance of having emotional intelligence. Start off by setting an example through remaining positive during risky periods. Take complicated and intricate problems and narrow them down to a few key drivers. Facilitate open forums to discuss issues and decisions among team members. Actively listen to everyone you come in contact with. The first step towards becoming the new financial leader is to start thinking like an owner. Owners are hyper-focused on making money. You have the knowledge and ability to help them get to their goal. Start with the basics. Something as simple as documenting your company’s economics and making sure that everyone in the company understands them and uses them in day-to-day decision making moves you out of the role of CFnO and helps you take more calculated risks. Knowing your economics is the foundation for risk-taking, decision making, and understanding your business. Need help shaping your economics to result in profit? 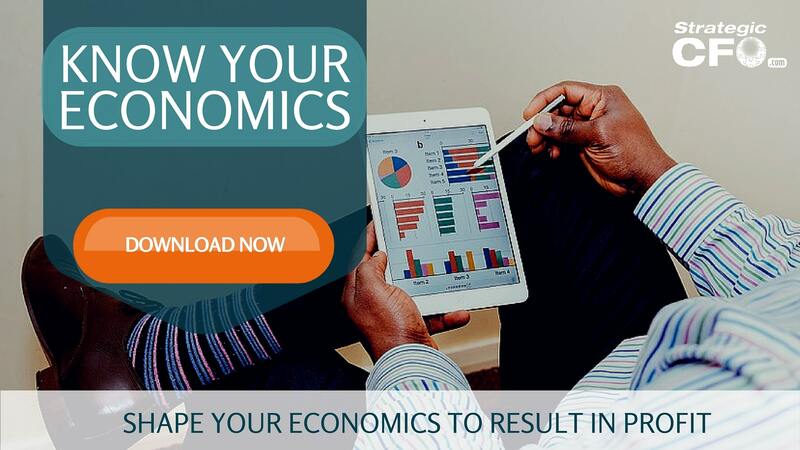 Check out our free Know Your Economics guide by clicking here. Take ownership in your company. Think like an owner as you sit in your financial position. This act of creating your own personal culture of accountability, purpose, and profit will increase your value to your company and help take you to the next level. And to answer our question, Can a CFO be a CEO?… I believe the answer is absolutely yes! If you want to learn more about how to become a better financial leader, click here. 2 Responses to Can a CFO be a CEO? Great topic. Now a days is crucial us CFOs try to understand whats going on in the CEOs head. In many cases not with the goal to become CEOs but to merely be a true value added as it is expected in the new role of the modern CFO. Long time I have been digesting what means to be a “strategic” CFO which is a trendy term, but having difficulties putting in black and white what that really means. Even if the CFO turns or get promoted as a CEO, will he have the power to dominate the financial side of the organization?